Cheelai want that Broly D. Don't be surprised if Broly has a half Saiyan half...green alien child? https://www.youtube.com/watch?v=hbeNDvwfDDM for anyone that wants to watch the movie. Its already on youtube with 720p quality. I watched it in the cinema's yesterday. Big screen with dolby surround is always the way to watch. If the anime comes back and redoes this movie like they did with BOG and ROF, I hope these scenes get included. Watched the Broly movie last night, fuc**** amazing, completely exceeded my expectations. Even with Gogeta being spoiled to me way in advance it was still exciting to see. I am very late in watching the movie so I won't say much now but I loved how they gave Broly more depth to his character and the minor tweaks in his back story. That little green alien girl is hot. I realize now Toriyama-sama needs to make Broly bust a nut, that's why he's so strong he's all backed up for 30+ years. It would be cool to get some green looking OP Super Saiyan-jin running around giving Trunks and Goten and run. Also the question now is what does a Broly with training to transform to God form look like? I think I was waiting for subs to come out and some of the comments were complaints so I just waited. After a couple months I got frustrated and impatient and found out the sub I watched was pretty good and I could of watched it long ago lol. You could've even watched it without subs. It was all basic anime Japanese anyway. I bet you would've understood most of it. San, don't you take that from Haoh 1. That's a borderline hard pass for me. 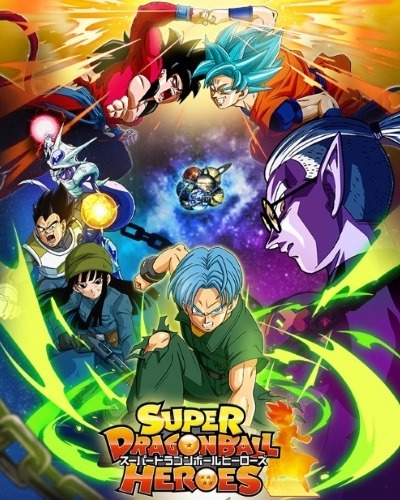 Super Dragonball Heroes poster with Cooler, SS4 Goku, SS Blue Goku, adult Mai adult Trunks and others on it.